Q-Connect Ruled Margin Spiral Soft Cover Notebook 160 Pages A4 (Pack of 5) KF01072 Pack of 5 Q-Connect A4 Spiral Bound Notepad, constructed over a rigid back board with micro-perforations for easy removal of sheets. Pre-punched with 4 holes for easy filing. Each pad contains 160 pages of quality White wove paper, ruled feint and margin. 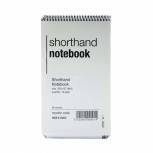 Q-Connect Feint Ruled Shorthand Notebook 300 Pages 203x127mm (Pack of 10) 31002 Pack of 10 Q-Connect Shorthand Notebooks. Quality ruled White wove paper. Spiral bound along the top edge with a rigid board back and a protective cover on the front. 203x127mm. 150 leaf. 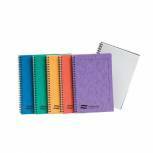 Q-Connect Ruled Margin Spiral Soft Cover Notebook 160 Pages A5 (Pack of 5) KF10039 Pack of 5 Q-Connect A5 Spiral Bound Notepad, constructed over a rigid back board with micro-perforations for easy removal of sheets. Pre-punched for easy filing. Each pad contains 160 pages of quality White wove paper, ruled - feint and margin. 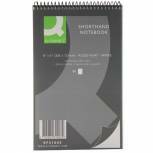 Q-Connect Feint Ruled Shorthand Notebook 160 Pages 203x127mm (Pack of 20) KF31003 Pack of 20 Q-Connect Shorthand Notebooks. Quality ruled White wove paper. Spiral bound along the top edge with a rigid board back and a protective cover on the front. 203x127mm. 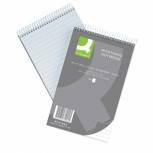 Spiral Shorthand Notebook 80 Leaf (Pack of 10) WX31003 Pack of 10 Spiral Notebook for easy note-taking. 80 leaf (160 pages). Feint ruled for better precision. Pack of 10 pads. 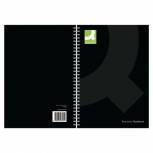 Q-Connect Hardback Wirebound Book A4 Black (Pack of 3) KF03727 Pack of 3 Q-Connect Wirebound Book. Premium quality notebook at an affordable price. Hard-wearing covers. Feint ruled. A4. Q-Connect Hardback Wirebound Book A5 Black (Pack of 3) KF03728 Pack of 3 Q-Connect Wirebound Book. Premium quality notebook at an affordable price. Hard-wearing covers. Feint ruled. Size: A5. 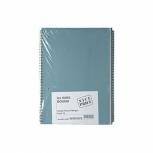 Blue Bound A4 Spiral Pad 80 leaf (Pack of 12) WX01072 Pack of 12 Notebook with 80 sheets/160 pages. Quality paper gives clean notes. Soft cover for easy quality. Size: A4. 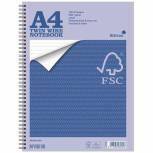 Pack of 12 pads..
Silvine Envrionmentally Friendly Wirebound Notebook 160 Pages A4 (Pack of 5) FSCTW80 Pack of 5 80 leaf A4 wirebound notebook made from 75gsm paper. Feint ruled with margin, perforated for full A4 tear out. 4 hole punched. Pack of 5. 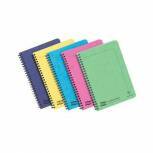 Clairefontaine Europa Notemaker A5 Assortment A (Pack of 10) 4850 Pack of 1 Europa Notemakers. Spiral bound pads. A5. side bound. Assorted Colours. 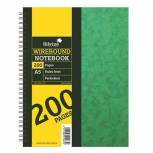 Silvine Luxpad Hardback Wirebound Notebook 200 Pages A5 (Pack of 6) SPA5 Pack of 6 Silvine Spiral Bound Notebook. Feint ruled with stiff green and yellow pressboard cover. Perforated for easy removal of pages. A5. Pack of 6. Silvine Elasticated Spiral Bound Pocket Notebook 192 Pages 76x127mm (Pack of 12) 194 Pack of 12 Silvine spiral elastic band book 96 leaf 203x125mm. Twin wire binding allows pages to be folded over. Feint ruled with elastic strap closure. 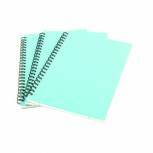 A5 Spiral Pad 80 Leaf Blue (Pack of 12) WX10039 Pack of 12 Spiral pad for stylish notes. Spiral binding for easy use. Feature 80 leaves (160 sheets). Protective and stylish blue cover. Size: A5 (148x210mm). Pack of 12 pads. 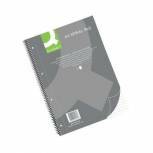 Spiral Shorthand Notebook 150 Leaf (Pack of 10) WX31002 Pack of 10 Spiral notebook for easy notation. 150 leaf (300 pages). Feint ruled for added neatness. Pack of 10 pads. 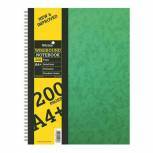 Silvine Luxpad Hardback Wirebound Notebook 200 Pages A4+ (Pack of 6) SPA4FEINT Pack of 6 Silvine Spiral Bound Notebook. Feint ruled with stiff green and yellow pressboard cover. Sidebound. 96 leaves. Perforated for easy removal of pages. Size: A4. 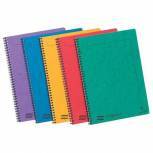 Cambridge Ruled Tapebound Legal Pad 160 Pages 76 x 127mm (Pack of 10) 100080057 Pack of 10 Feint ruled notebook with durable card covers. 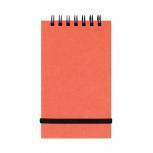 Elastic closure keeps notes secure and acts as a page marker. 76 x 127mm. 160 pages. Black. Pack 10. 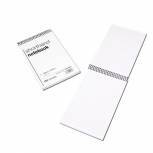 Clairefontaine Europa Notemaker A5 Assortment C (Pack of 10) 3155 Pack of 1 Europa Notemakers. A5 size. wiro side bound. 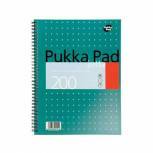 60 leaf pad with quality feint ruled White paper that has micro-perforations for easy removal of sheets. Supplied in an assorted pack.